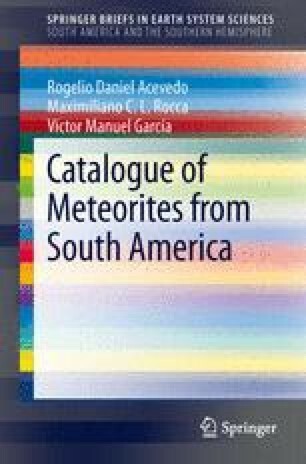 A chondrite remains so far is the only one meteorite Ecuadorian recuperated (Fig. 7.1), and it is a witnessed fall which makes it very special. A noisy explosion was heard along the Daule river on Sunday March 23, 2008, at 09:30 h. After a violent shock wave, four stones were seen to fall separated by 4 km each one.The main stone of 4 kg was found in a farm in a pit of about 1 m in depth and 30 cm in diameter. A second fragment fell on a river at a place called El Pedregal, and the others were lost.